On Sunday 5th September Canterbury�s Marc Chapman won the tenth annual Planet Hastings Crazy Golf Club Open. The four-round tournament was played out over 72-holes on the three seafront miniature golf courses and at Planet Hastings (White Rock Gardens) Adventure Golf Course in Hastings, East Sussex. 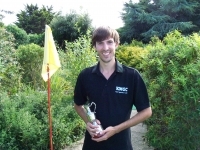 A total of 21 players competed in the event, with Chapman, a member of the Kent Minigolf Club, lifting the coveted Claret Jug trophy following a sudden-death play-off with Tim Davies of Hastings, after both players had hit scores of 140(-4). The win followed Chapman�s recent return from Predazzo, Italy where he represented Great Britain in the European Minigolf Championships. Michael Smith from Oxford continued his good form this season with another podium place, finishing in third place. Defending 2009 Planet Hastings Open champion Andy Exall, from Paddock Wood, was fourth overall. The top novice player at the event was Planet Hastings Crazy Golf Club Member Curran Annetts, playing in his second BMGA event, who finished in 18th place of a very experienced field. The top lady Minigolfer prize at the event went to Welsh Ladies Number One Cindy Kukielka from Cwmbran. The British Minigolf Association Tour is back in Hastings for the BMGA Players Championships and BMGA British Open in Hastings on September 17th, 18th and 19th, and the Castle Golf World Crazy Golf Championships in October. Congratulations Marc. The European Championships experience is paying!